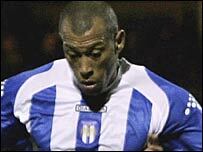 Manager Geraint Williams insists Colchester will do their best to keep striker Chris Iwelumo at the club. Iwelumo, 28, has scored 18 goals this season but is out of contract at Layer Road this summer and thus able to leave on a free transfer. "Chris is in negotiations with us. But he's well within his rights to see what he can get and do the best for his family," Williams told BBC Essex. "He's had a fantastic season - we understand his situation." Williams added: "We want to do what's best for him and the club as well." Iwelumo's former club Stoke is reported to be among those interested in him.